A party of archaeologists discovers the remnants of a mutant five-millennia-old Sumerian civilization living beneath a glacier atop a mountain in Mesopotamia. A giant prehistoric praying mantis, recently freed from the Arctic ice, voraciously preys on American military at the DEW Line and works its way south. Rocks from a meteor which grow when in contact with water threaten a sleepy Southwestern desert community. Three men and a woman crash-land in a deep crater in Antarctica, where they find a prehistoric world. A spider escapes from an isolated Arizona desert laboratory experimenting in giantism and grows to tremendous size as it wreaks havoc on the local inhabitants. A scientist captures the Creature and turns him into an air-breather, only for him to escape and start killing. The blood of a primitive fish exposed to gamma rays causes a benign research professor to regress to an ape-like, bloodthirsty prehistoric hominid. The first U.S. spaceship to Venus crash-lands off the coast of Sicily on its return trip. A dangerous, lizard-like creature comes with it and quickly grows gigantic. An endocrinologist in a dysfunctional marriage with an aging, alcoholic wife journeys to Africa seeking a drug that will restore youth. Men capture the creature from the Black Lagoon and make him an aquarium attraction, from which he escapes. Extraterrestrials traveling in high-tech flying saucers contact a scientist as part of a plan to enslave the inhabitants of Earth. Dr. Roger Bentley: Archaeologists are underpaid publicity agents for deceased royalty. 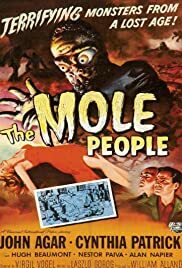 The Mole People is one of those science fiction cheapies that you wish had a bigger budget. I found it to be one of the most imaginative of science fiction films of the fifties. It would get a far better rating from me if a few more dollars had been put in. A team of scientists on top a mountain in what would be ancient Mesopotamia, today Iraq find on top the mountain a cave leading to an ancient Sumerian civilization which has survived their almost for 5000 years. Probably the greatest archaeological find ever, imagine finding some ancient Egyptians hidden away, clinging to their cultural traditions. The greatest opportunity ever to research a culture. Of course some of these are not quite human, they've returned to being mole like humans and they're the slaves. It's a slow punishment for the bad, a quick punishment is the hated fires of Ishtar. You're sent into what looks like an oven and you're burnt away to ashes. The film does a marvelous job in building up the viewers fears of the fires of Ishtar so in the end when the scientists are flung into it, we're scared witless. John Agar, Hugh Beaumont, and Nestor Paiva are some of the scientists and the high priest of Ishtar is Alan Napier. What is the fire of Ishtar? That's not a question to be answered here. See the film and find out.